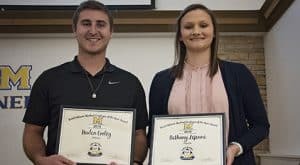 McNeese State University student Haden Cooley, of Welsh, has been recognized as the McNeese 2018 Janet Delaine Student Employee of the Year. Cooley works in the Recreational Sports Complex. Bethany Lejeune, of Mermentau, was the other finalist for this award. Lejeune works in the admissions and recruiting office. McNeese currently employs 563 students throughout the campus. The Student Employee of the Year Program – sponsored by the National Student Employment Association and the Southern Association of Student Employment Administrators – recognizes students who demonstrate reliability, quality of work, initiative, professionalism and contributions, according to Derek Fontenot, student employment administrator. 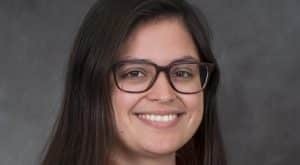 The annual award is named in of honor the late Janet Delaine, who was a member of the Student Employee of the Year Committee and assistant director of financial aid at McNeese. Dr. George Mead, dean of the College of Science and Agriculture at McNeese State University, has been awarded the Distinguished Teaching Award for 2018 by the Louisiana/Mississippi Section of the Mathematical Association of America. Mead is one of 24 mathematicians nationwide to receive this award, conferred at the spring meetings of each of the 24 sections of the MAA. These award winners represent the very highest level of mathematics teaching and the awards serve to identify, honor and reward exceptional college and university teaching. The dean came to McNeese in 1981 as an assistant professor of mathematics and computing science, became head of the Department of Mathematics, Computer Science and Statistics in 1983 and was named dean of the college in 1996. Mead received his doctorate in mathematics from the University of South Florida. Dr. Henry B. Sirgo, McLeod Endowed Professor at McNeese, presented a paper titled “Louisiana Constitutions and Human Rights,” at the Southern Politics session at the 2018 Annual Meeting of the Southern Political Science Association in New Orleans. Dr. Ann Warner, professor of graduate nursing and co-coordinator of the graduate nursing program at McNeese, and Dr. Twila Sterling-Guillory, associate professor of graduate nursing at McNeese, presented a poster titled “Focused Scholarly Project: A Strategy to Develop Nursing Scholarship” at the recent American Association of Colleges of Nursing Master’s Education Conference on “A Changing Health Care Environment: Transforming Master’s Education” in Anaheim, California. The conference examined the role of higher education in preparing nurses for a changing health care and practice environment.